It has been suggested that up to 90% of juvenile Pacific salmon may die within their first eight weeks at sea, but no recent surveys have been conducted to support this. One project through the Salish Sea Marine Survival project examined the early marine distribution, growth, and survival of juvenile Pacific salmon, focusing on Chinook and Coho. The objective was to obtain information on juvenile salmon before they move offshore to deeper areas of the Strait of Georgia. Several previous research studies have attempted to investigate where salmon are dying in the marine environment but few answers have resulted. The past approach has been to mark fish in freshwater and count the number of marked fish that return in the marine environment. This number is compared to the total number of fish that return in order to achieve a ratio that can be extrapolated to determine mortality rates. Therein lies the rub. Imagine turning over thousands of dead salmon carcasses as is the case with some productive watersheds. This method can be logistically and technologically challenging. Through the Salish Sea Marine Survival Project, the Pacific Salmon Foundation partnered with the BC Conservation Foundations on a solution that approached from a new direction. 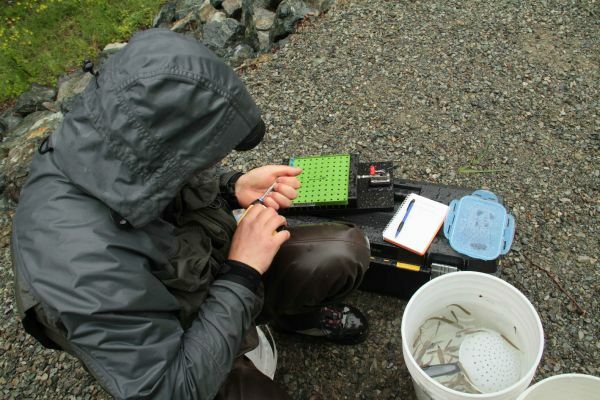 PIT tags, short for Passive Integrated Transponder, were inserted into fish providing a lifetime individual barcode that was read by a receivers in the river, mounted on seals' heads, and hand-held in the form of wands. The individual codes for each tag allow for an infinite range of marking locations, times, species, and sizes down to fish measuring only 65mm. For the study fish were tagged at three different points of the journey out to ocean: 1) leaving the hatchery; 2) in the estuary, 3) just outside the near-shore environment. By comparing the survival of fish within each group we were able to determine just how high mortality rates are in the early marine period. The information from the PIT tags helped determine marine and freshwater survival, extent of seal predation as well as the growth and movement of small salmon. 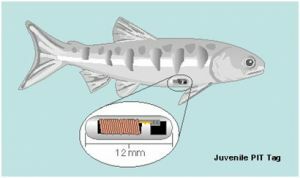 Moreover, use of PIT tags helped us make significant progress in identifying the relative survival of juvenile Chinook throughout sequential stages in their early marine life. 4. Shop our online store.